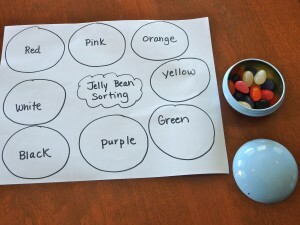 This is the jelly bean variation of a My Obstacle Course Sorting Station Activity that I have posted on before. Here is the link for the one using Colored Marshmallows. The set up is super simple, requiring only white printer paper, a marker, some jelly beans and a container. (See below about the container I am using.) 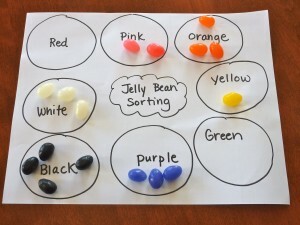 This is a great way to link color words with colored items and basic skills of sorting according to a certain characteristic, counting and analyzing data. You can use the same question cards used with Jelly Bean Graphing. Click on this link for a PDF file: Jelly Bean Questions. You can also add some cards with the color words on them (or even use something like Candy Land cards or make your own color cards using sticker dots – Just thought of this idea as I was writing so look for a post on this soon!) and they could flip them over two at a time and add those colors together (ex. pink + orange= __. The equation for this based on the completed sort below would be 2+3=5.). The seasonal aisle of the grocery store is a great place to find fun, thematic items that can also help build basic academic skills such as this cute M&M container. 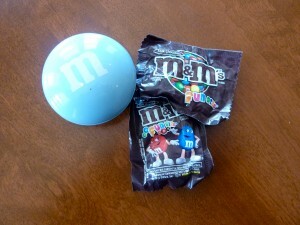 It is a tin that pulls apart and holds two small packages of M&M candy. Once opened, the candy can be sorted by color, used to make a graph, used to make basic addition equations based on color (ex. green + red = ___ ), or paired with some dice for addition or subtraction practice. Don’t throw away these little containers just yet! They are perfect for use in future My Obstacle Courses to hold small items for counting, sorting or graphing like coins, jelly beans (like I did in the photo above), buttons, beans, etc. 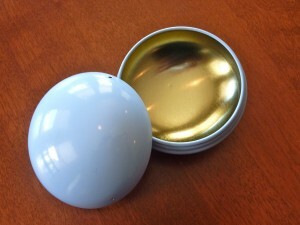 Inside of the container - perfect for holding small items!